Nice ranks as the second destination of business jets in Europe. 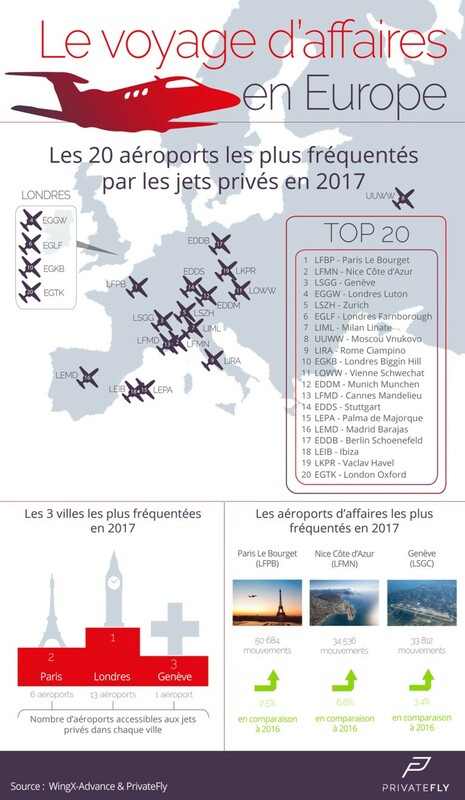 According to a study by WingX-Advance, France remains the country hosting the largest number of private aircraft movements in Europe in 2017, ahead of Germany and the United Kingdom. The study states that this growth was beneficial for the 20 largest business airports in 2017, with activity up 4% over the previous year in Europe. With nearly 35,000 movements registered in 2017, more than 6.6% compared to 2016, the Nice-Côte d'Azur airport is in second place in the ranking, just ahead of Geneva (34,000 movements), and behind Paris-Le Bourget (50,000 movements). Cannes-Mandelieu airport is ranked thirteenth. As a reminder, the Nice-Côte d'Azur airport is the first French airport outside Paris. In 2017, it crossed the mark of 13 million passengers and has just been awarded by the BVA Institute "Customer Service of the Year 2018".